The perfect gift: children, lovers, friends, birthdays, Christmas, home decor are all good gifts. Filling material: Made of high quality PP cotton, it does not contain chemicals that may harm or stimulate your child's sensitive skin. Safe and skin friendly, I believe your child will like stuffed elephant. Exquisite workmanship: Each large stuffed elephant is professionally sewn without tearing or leaking fillers. Fully functional: it can be used as a toy/doll to help your child to sleep and hug; or on the sofa, living room, bed,or holiday decorations. Size weight: the giant plush elephant 23.4 x 15.6 x 9.8 inches, total weight 2 pounds. Care instructions: Recommended hand wash, low temperature, do not bleach, dry, do not iron. Packing: The elephant plush toy is vacuum-sealed. When the package is removed, it can be returned to its normal size by taking a shot of its fluff. ➤Dimensions: 60 x 40 x 25cm / 23.4 x 15.6 x 9.8" (L x W x H). ➤Uses: This soft toy is very suitable for hugs, playfulness, mischief; can be placed on the bed, on the sofa; it is a toy, a cushion of a chair. As long as you see this stuffed elephant, anyone will fall in love with it. ➤Gift: This elephant gifts will be loved by everyone. It is suitable for any occasion, such as birthday, anniversary, Valentine's Day, Christmas, etc. 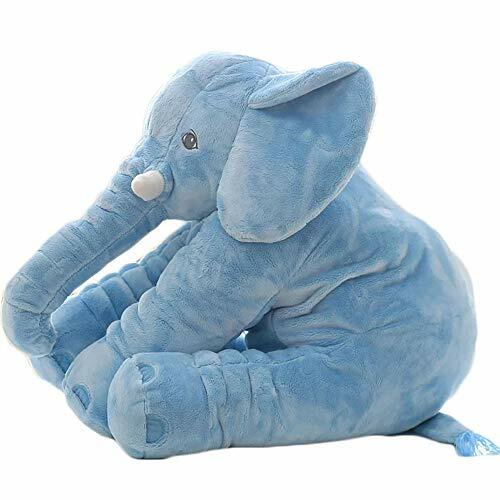 ➤Material: This elephant decor pillow is made of super soft fabric, PP cotton padding, exquisite workmanship, fluffy ears and soft torso, giving you a better skin feel; no odor, safer and more assured. ➤Maintenance: This elephant stuffed animal can be washed, not bleached; after a few taps, the elephant will return to its original state.